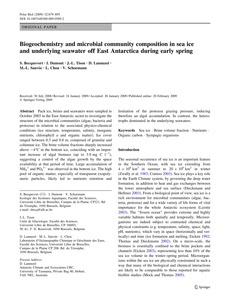 Pack ice, brines and seawaters were sampled in October 2003 in the East Antarctic sector to investigate the structure of the microbial communities (algae, bacteria and protozoa) in relation to the associated physico-chemical conditions (ice structure, temperature, salinity, inorganic nutrients, chlorophyll a and organic matter). Ice cover ranged between 0.3 and 0.8 m, composed of granular and columnar ice. The brine volume fractions sharply increased above -4C in the bottom ice, coinciding with an important increase of algal biomass (up to 3.9 mg C l-1), suggesting a control of the algae growth by the space availability at that period of time. Large accumulation of NH4 ? and PO4 3- was observed in the bottom ice. The high pool of organic matter, especially of transparent exopolymeric particles, likely led to nutrients retention and limitation of the protozoa grazing pressure, inducing therefore an algal accumulation. In contrast, the heterotrophs dominated in the underlying seawaters.